Happy New Year 2010! I hope your year has started off well. Howard and I shared a quiet dinner at home on New Year’s Eve. 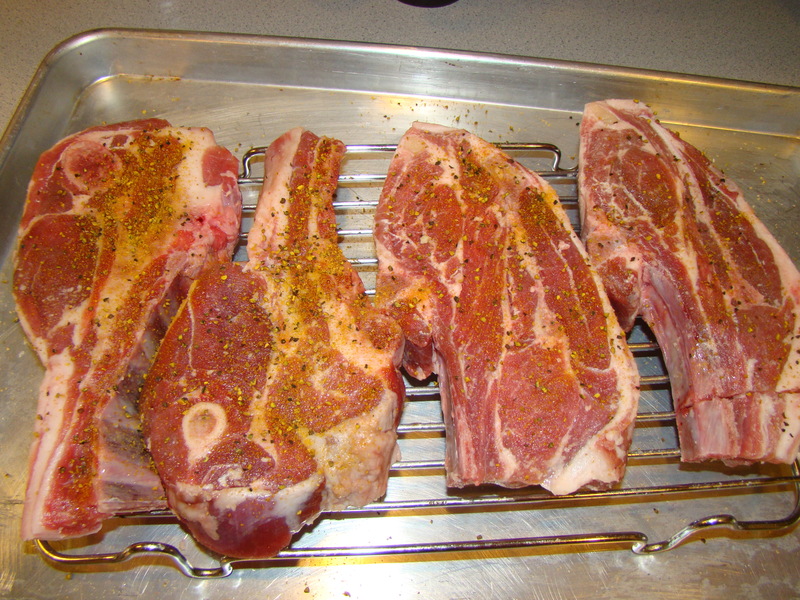 We had a few lamb shoulder chops from Chestnut Farms. I had never cooked this cut before, only rib chops and loin chops. Browsing through a few cookbooks indicated shoulder chops needed a slower cook than the chops I was used to. I found a yummy-looking recipe that baked the shoulder chops on a bed of potatoes and onions. Unfortunately, I hadn’t read the recipe all the way through. Around 6:00, Howard popped open a bottle of champagne, and I opened the cookbook. Uh-oh, the lamb needed to bake for almost 2 hours. I guess I was starting (or ending) the year with rather poor planning. Howard looked in one of his ever-trusty Cooks Illustrated cookbooks and found that the shoulder chops could be simply broiled. I traded in the bed of potatoes for a pot of lentils and some roasted carrots and celery root. Dinner was ready in the half the time. Redemption! 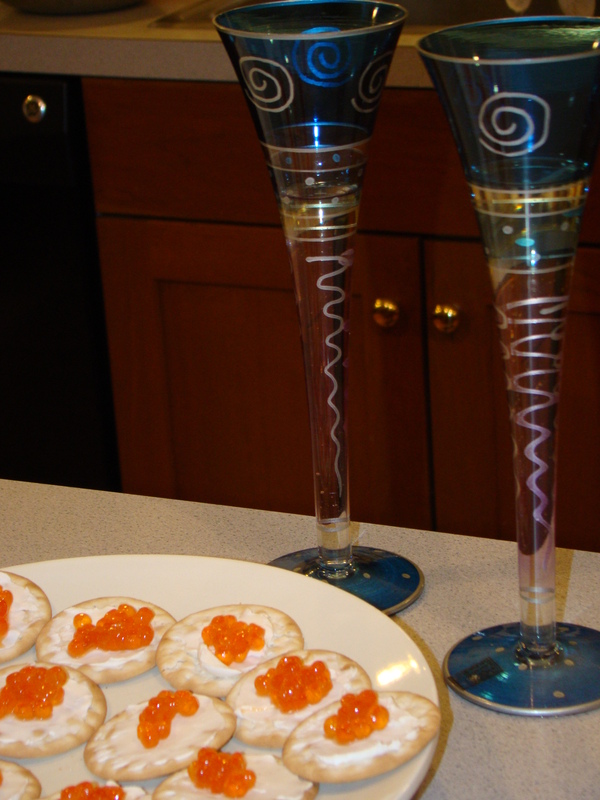 While dinner cooked, we sipped champagne and nibbled on salmon caviar and crackers and some local oysters (Wianno, Wellfleet and Island Creek, all from the Cape, courtesy of Whole Foods). After dinner, we watched a movie (Away We Go) and managed to stay up until 11:45 before dropping off to sleep. Seeing midnight no longer seems as important as it did when I was younger. Our New Year’s Eve dinner was quiet and romantic. On New Year’s Day, we invited our friends Laury, John, and Isabel for dinner. We had a pork roast from Codman Farm. I made a spice rub from garlic, lime juice, cumin, and cilantro to go on the pork plus Cuban Sweet Potatoes and Braised Cabbage to go with the meat. The big hit was the sweet potatoes. It had similar flavors to the pork, and the whole bowl disappeared fast. The year is off to a great start with two things that are really important to me: spending time and sharing meals with some of my favorite people, and eating food that has been sustainably and humanely produced, from local farms. I’m looking forward to more of the same in the year ahead. Peel the sweet potatoes. Cut them into ½-inch slices. If the rounds are large, cut in half again (into half moons). Toss the potato slices in a bowl with olive oil. Spread them out on a baking sheet (or two) in one layer. Bake for 20 to 30 minutes, until they are nice and tender. Combine the garlic, cilantro, and lime juice in a big bowl. Add the hot sweet potatoes and toss. Season with salt and pepper to taste. Posted on 4 January 2010, in Meat CSA, Winter CSA and tagged CSA, root vegetables, sweet potatoes, Vegetables. Bookmark the permalink. Leave a comment.